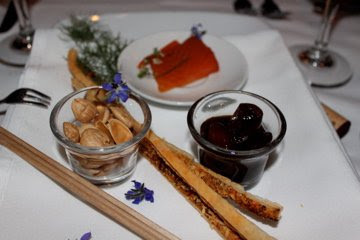 A week ago, I had the pleasure of dining with the publishers of the upcoming new Edible Reno/Tahoe Magazine at the wonderful La Ferme Restaurant in Genoa, NV. 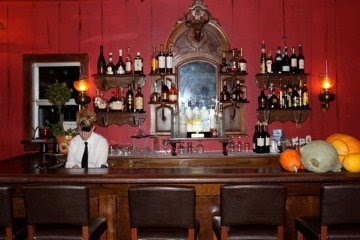 The French Country restaurant is owned by a close family-friend, Gilles LaGouge who is French-Basque. He and his business partner and chef, Yves Gigot, opened La Ferme in the tiny, quaint and historic town of Genoa in 1998. The pair have roots in Los Angeles, along with pretty famous and interesting careers to back them up that have spanned 25+ years in the restaurant biz - very impressive! La Ferme is like no other restaurant - its European charm and warmth envelope you as soon as you set foot on Gilles' property and by the time you've completed your dining experience for the evening, you just want to move in and never leave. Not only does their food offer and extraordinary journey for your taste buds, but truly all of your senses will be touched and catered to during a trip to La Ferme. In addition to the wonderful and rustic house that La Ferme resides in, there is also the experience of stepping inside Gilles Menagerie & Boutique, housed inside one of the oldest bunk houses in Genoa - it's been restored of course, and oozes charm and charisma just like its owner, Gilles. The Boutique is Gilles' "sanctuary" so to speak, and a creative place that grew from his heart, offering clients the chance to purchase unique, one-of-a-kind gifts from all over Europe and the world...my favorite items come from the Basque Country, of course. In addition, Gilles has created a gorgeous line of jewelry that can be custom-ordered. It's an experience that's NOT to be missed when visiting La Ferme. Gilles' clientele come from all over the States and the world, scooping up his treasures, while appreciating his fine taste and eye for beauty. Now to the food...our meals were incredible, as always. I hadn't been back to La Ferme in a couple of years and I had missed the experience of dining there and the fun and enchanting conversations that are always had with Gilles. 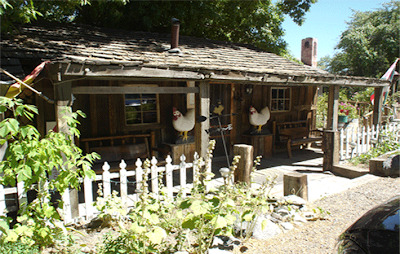 This trip was especially enjoyable and fruitful, connecting La Ferme with the great gals Amanda and Jaci, who are starting Edible Reno/Tahoe magazine. Their appreciation for great, organic, farm-fresh food is contagious, and I can say that it was a very enlightened night of conversation and toasts! In addition, we received a tour of Yves' kitchen and met with their darling sous chef, Anne. The other important news to share with fellow Celiacs or the gluten-intolerant is...La Ferme is very aware and able to prepare a variety of meals sans-gluten. That's the benefit of eating food that's incredibly fresh and not too tampered with - so have no reservations about being able to dine fabulously and without fear...but do make reservations. 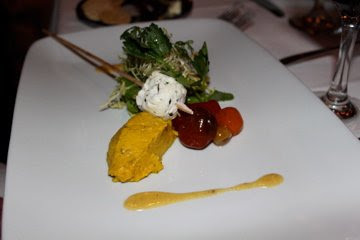 Our first course was brought to us courtesy of Chef Yves Gigot, and other than the bread, I was able to eat everything. My entree was so beautiful to the eye, that I really didn't want to disturb its perfection...but alas, my desire and hunger won out...This has always been my favorite dish at La Ferme...and somehow they continue to perfect it! 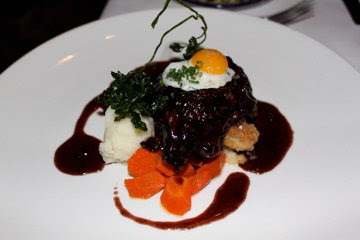 Coq au Vin "Mere Grand"
And if it's hard to believe there was still room for dessert, think again. This amazing little French creation was like eating sugary, lemony clouds dancing around in the sky...sigh....can it get any better than this? Non! 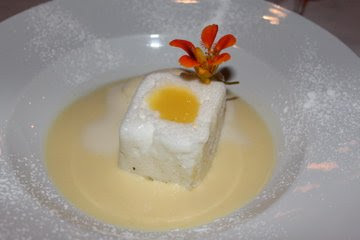 Floating Island: lemon curd and oeufala neige. A French-Basque treat! Now that your mouth is watering and your are warming up the car to drive to La Ferme for dinner, make sure you call first for a reservation and note that they are closed on Mondays. La Ferme is now also offering, in addition to their fabulous daily menu, a three-course meal that includes wine and coffee for only $35 per person - an amazing offer that you can experience Tuesday through Sunday nights. And finally, Gilles wanted everyone to know that La Ferme is also in the catering business, providing clients with the incredible quality of food served in their restaurant, with very affordable catering/event rates. 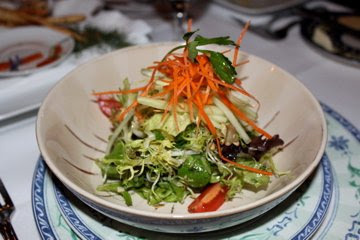 They are able to cater small gatherings to large events and weddings...and everything in between. Contact them directly for more information. As we were leaving La Ferme last week after our fantastic dining experience, we had the pleasure of being visited by one of Gilles and Yves' gorgeous Great Pyrenees dogs, Neige. She and her siblings are regulars at La Ferme and they truly add to the unique, family-like atmosphere...don't be mistaken, they ARE part of the La Ferme family. There's a grand portrait of them all above the kitchen door to prove it! We woke up to find our first news article about Tia's Sweet Treats in today's (this week's) Northern Nevada Business Weekly! 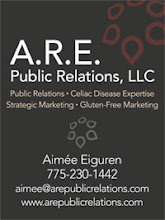 We are so excited about carving our little Gluten-Free niche here in Reno, and well beyond. We are baking away this week, so place your orders now on-line or call:775-230-1442 . 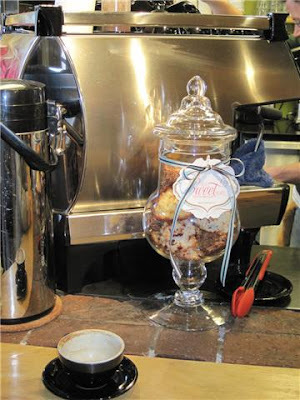 The other great news for Tia's Sweet Treats is that our macaroons are now being sold at The Hub Coffee Co. in Reno on Gluten-Free Thursdays! The Hub is located at: 26 Cheney St. in downtown Reno. See you there for an amazing cappuccino and macaroon! A post-holiday crazy, busy week inspired this yummy and simple breakfast-for-dinner idea that I thought you might like to cook in your kitchen. Growing up in my family, there were times when we would have breakfast for dinner - the occasional omelette or pancakes were always a big hit with my brother and me and still to this day, I love whipping up scrambled eggs as an entree! With that in mind, I've been revisiting my childhood love (totally inspired by my mother)of poached eggs on toast...or in this case, a softly fried eggs on toast. Paired with some delicious cheese, and fresh tomatoes with a fig balsamic, you've got yourself one tasty and nutritious meal that can be created in ten minutes. I've also been on a fresh herb kick lately. While perusing the Whole Foods produce section the other day, I came across a perfect package of fresh sage, thyme and rosemary and have been throwing them in with just about everything I've eaten. I'm always amazed at what a fresh herb will do to your food - with nothing more than some olive oil and sea salt to accompany, food comes to life under the profound influence of an herb. And when I cook this way, it's a distinct reminder about the essence and importance of eating real food and why we do not need to alter everything, process it with junk and throw it in a box to be eaten via microwave. Blahhh - I'm getting the chills just thinking about that process, all the while, the poor food screaming out, "we taste great just as we are, just as nature intended...honest!" So, to keep your food from screaming out with displeasure...try this simple recipe for lightly fried/poached eggs on toast with rosemary, avocados and delicious little tomatoes. First, wash and half the cherry tomatoes and place them in a saute pan with 2 tsp. of olive oil, salt and pepper. Add sprigs of fresh herbs, as much as you like, and saute for 5-7 minutes on med-high, until tomatoes start to soften. Then put bread slices in toaster for your desired amount of toastyness. 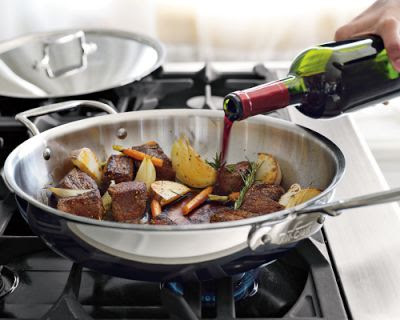 While toasting, remove tomatoes from burner and place to the side in a separate bowl. Use the same saute pan to lightly fry your eggs - cook with rosemary and until yolks just start to form. Spread pats of butter onto the toast, then place two on each plate. Layer with fresh cheese slices, turkey and then place fried egg on top (to melt it all together!). Slice fresh avocado on top of the eggs and divide up the sauteed tomatoes onto each plate. Drizzle fig balsamic on tomatoes. Salt and pepper to your liking. That's it - simple and delicious. Enjoy your breakfast-for-dinner or whenever really, and keep your food happy! 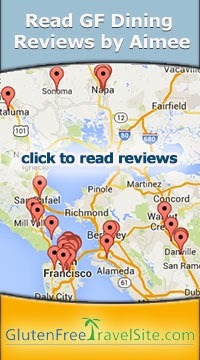 I would love to hear about what your favorite gluten-free recipes are! I don't know about you, but I can say that I'm thrilled to be leaving good old 2009 in the dust and moving into 2010. It's not that last year didn't have it's bright spots, but let's just say it was a very challenging year, especially in regards to my health, given the numerous gluten poisonings that I endured. Seriously though...It is my goal. Better self care and being a stronger advocate for myself. The point is that I can't wait to start cooking more and more at home and eating out less and less. I will also have to fess up to the fact that I've now watched the movie, "Julie and Julia" three times and am seriously contemplating selling everything I own, throwing caution to the wind, and moving to Paris to attend Le Cordon Bleu! I wish. But don't think this thought hasn't seriously been swirling around my head for the past two weeks, all inspired by a love of cooking, a really good movie and cookbook and the beginning of Tia's Sweet Treats. Cooking and baking seem to be taking up permanent residence in my kitchen and in my life - I love that. There's just something so damn romantic to me about being inside my cozy home, music playing low, candles lit and being in the kitchen creating delicious and gluten-free food to eat and share with others. I am finding more and more that the kitchen is becoming my inspiration for creative thinking, and the more I want to cook, the more I want to write...okay and then travel! They all seem to inspire me in equal-parts/different ways. That being said, after this latest Christmas/family trip/NYE vacation to San Diego to spend time with my brother and his family, I'll be staying put for a while. Thought I was soooooooooo grateful to have traveled for ten days without any gluten incidents...see, I'm already off to a good start. Even our day at Disneyland proved to be joyful and safe. Not only did we pack a hearty lunch for everyone, but the Mexican restaurant that we ate dinner at (us and 10 million others) contained one very helpful chef who KNEW all about eating gluten-free, and guided me through my entire meal selection. It was awesome, I have to say! Thank you Mr. Disney chef! 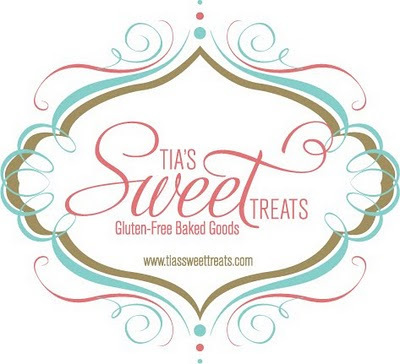 On another bright note - Tia's Sweet Treats is up and running and ready to take your orders. 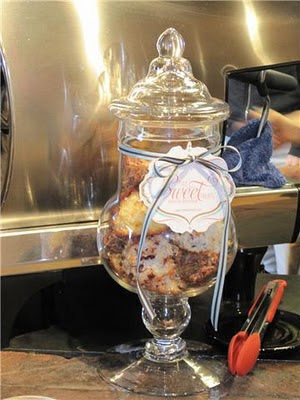 Our gluten-free, organic Macaroons brought a lot of smiles to the faces of our first customers during the holidays. We would love to put smiles on more and more faces. 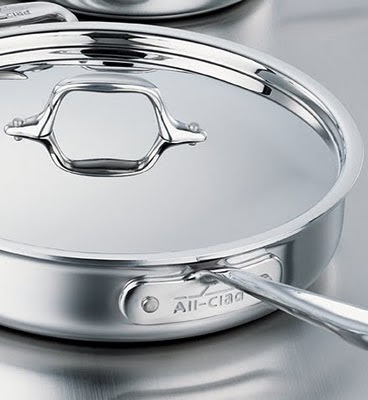 Between baking macaroons and cooking in my new All-Clad saute pan, I'm sure to be a very happy camper in the coming days and weeks, and I cannot promise that I won't be tempted to move "Julie and Julia" back to the #1position in my Netflix queue - sorry, just too tempting and inspirational!